Best Western Hotels & Resorts will soon add a new seafront property in the resort town of Hua Hin, on Thailand’s gulf coast, to its portfolio. 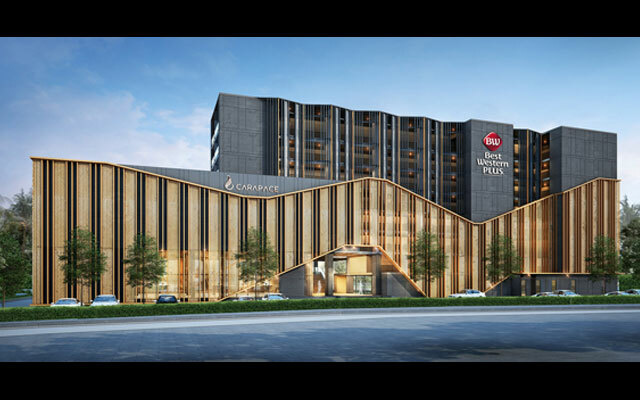 Best Western Plus Carapace Hotel Khao Tao will feature 410 guestrooms featuring modern amenities and a balcony. Ground floor rooms will have terraces with direct access to pools. Amenities include a pool bar, beach bar, a restaurant serving breakfast and all-day Thai and international cuisine, a coffee shop, a fitness centre, while on-site parking will be available. The centerpiece of the resort will be a series of freeform lagoon pools, slides, waterfalls and a children’s water playzone, surrounded by tropical palm trees, sun decks and cabanas. The property stands just south of the Hua Hin town centre, and is a 2.5 hours drive from Bangkok.